Viprosal in an absolutely unique way relieves tension, relieves strained muscles, contusions, stiffnesses. The main component is a common viper venom which increases capillary permeability and influences blood clotting. 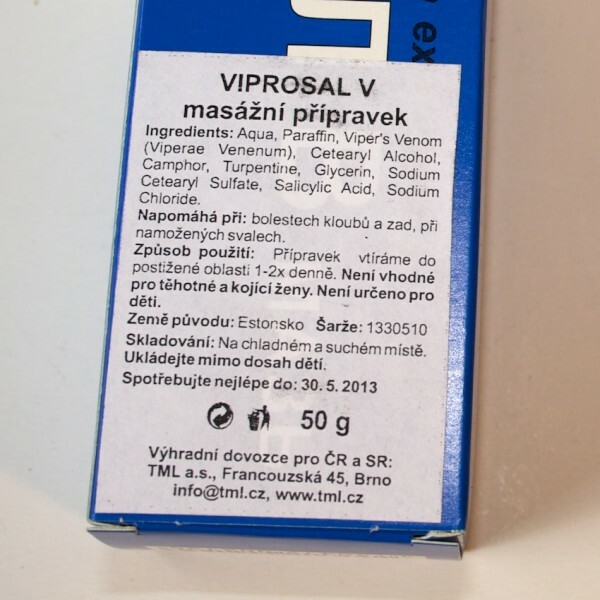 After application of Viprosal the blood circulation increases and protective mechanisms of the organism are activated. Viprosal contains anti-irritant components and acts as an analgetic - relieves pain and its component turpentine oil has antiseptic effect. Ingredients: the main component is common viper venom, camphor, turpentine, salicylic acid. according to the size of the affected area apply smaller 5-10g volumes (1 to 2 teaspoons) on the painful area and massage into the skin according to pain intensity 1-2 times a day until the pain disappears. The length of treatment depends on the nature and severity of the disease. Do not use in case of intolerance - strong reddening, alergy. Do not use during TBC of lungs, during heavy liver and kidneys damage, during insufficient blood circulation of brain and heart. Do not apply in the area of damaged and injured skin.